Maurice was born at Highbridge, Somerset and enjoyed drawing and painting from early childhood. After leaving Brymore School, Cannington, he had various jobs, whilst continuing to paint as a hobby, eventually painting full-time at Burnham on Sea in 1979. In 1987 Maurice moved his gallery to Dunster and has since opened an additional gallery in Lynmouth where he now spends the majority of his time. Maurice is self-taught, painting in oils on canvas using his drawings, photographs and imagination together with personal experience to create his impression of a landscape. Exmoor is particularly inspirational to Maurice and his work includes many of the scenes which make Exmoor a firm favourite with visitors – Watersmeet, Malmsmead, Tarr Steps, Porlock, Dunkery and Lynmouth Harbour. It also captures the more elusive images through paintings such as ‘Final Over at the Valley of the Rocks’, ‘Home to Lynmouth on a Moonlit Tide’ and ‘Exmoor Majesty’ which features the famous red deer. Maurice has painted themes depicting a journey towards the light such as ‘The Journey’, ‘Against All Odds’ and ‘Together at Sunset’ reflecting, perhaps, his optimistic view of our world. More recently Maurice has been exploring with the colours of the spectrum through his Rainbow Series which combines the beauty of nature with the vibrancy of colour. Maurice does not accept commissions because he prefers the freedom of painting what he enjoys. He has created a great following for his work with regular repeat visitors to the family galleries in Dunster, Lynmouth and Sidmouth and in many private collections worldwide keeping followers intrigued with where his creativity will take him next. Maurice’s work has been featured in many publications and used for CD covers. Maurice’s work is printed on acid free paper using light fast inks. 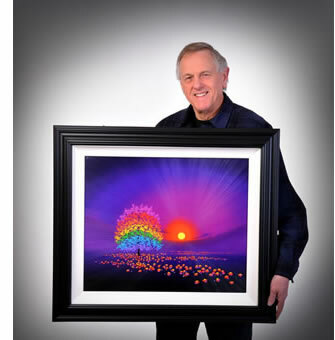 A popular addition to the range enables the images to be hung as giclees on box canvases. This method of presentation makes framing unnecessary and creates a more contemporary look. If you have visited Maurice’s galleries, you may have seen the triptych ( three part) prints on canvas which are available by special order on certain titles. Many titles are also available as blank greeting cards which make excellent invitations for special occasions, such as weddings. If you see a title that you would like to use please call / email us with the quantity you require and we can arrange a multiple purchase price for you.